Guests are met in Paris and transferred to the barge mooring in the peaceful village of Briare. After a Champagne welcome, we enjoy an evening cruise crossing the Loire valley on a canal Bridge. This magnificent structure was designed by Gustav Eiffel in 1890. Tonight you can enjoy your first of many gourmet meals on board. 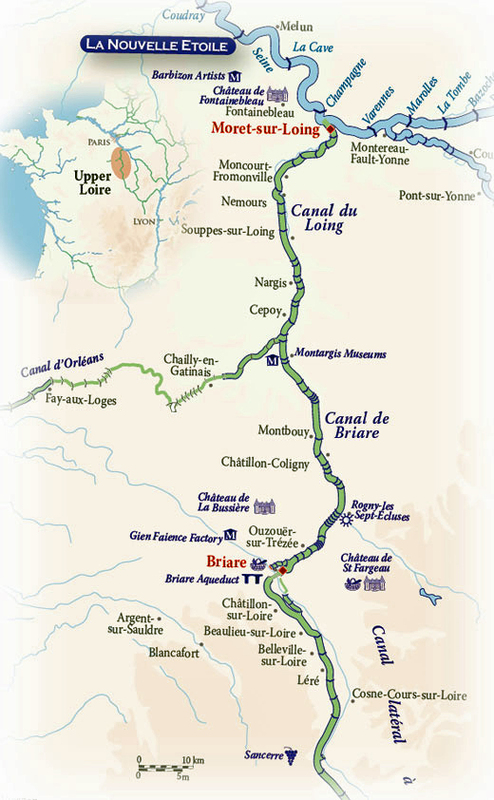 Today our cruise takes us through a number of locks in the upper Loire area till we reach Rogny-les-sept-ecluses. (Seven locks of Rogny). This "staircase" of seven locks was built in 1648 and is an impressive tribute to the engineers of the past. After lunch we drive out to the Sancerre wine region to sample some of this delicious wine and maybe taste some of the local Crottin de Chavignol cheese on our way back to the barge. Dinner on board. After breakfast, we cruise to the charming village of Montbuy. Enjoy lunch on board before our drive to the magnificent 10th century Château Fargeau. The château is over a thousand years old and the most important history place of Puisaye Forterre. Dinner on board. This morning we take a short drive to the beautiful town of Gien, built on the river banks of the Loire. Gien is famous for its faïence earthenware and we visit both the factory and the museum. Lunch on board as we cruise to Montargis with plenty of opportunity to bike or walk the towpaths. Dinner on board. This morning, we visit Montargis also called "Little Venice of the Gatinais" because of its numerous canals. Shop at the famous Mazet Praline confectioners with its exquisitely packaged delicacies or visit one of the many museums. Upon return to the barge, we continue our cruise to Nemours. Dinner on board. 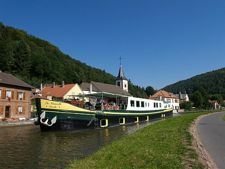 Enjoy breakfast on board before we take a leisurely cruise to Moret sur Loing where the canal meets the river Seine. After lunch we visit the Palace of Fontainebleau. To walk through this palace is to walk through the history of France where each Royal Family added their own architectural style. On your way back to the barge you can take an optional stroll through the medieval walled town of Moret-sur-Loing, known to many as the home of the famous impressionist painter, Alfred Sisley. Return at your leisure to the barge for the Captain's Farewell Dinner on board.